There are over 50,000 people in North America who define themselves as Hutterites, though you probably have never met one. 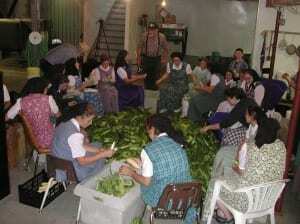 One of the main branches of the Anabaptists, Hutterites live in self-sustaining communities throughout the rural northwestern United States and Canada. Like their sister branches, the Amish and the Mennonites, the history and culture of the Hutterites have long fascinated scholars. But there have been few forays into the genetics of this unique community – until now. In the October 21 issue of the European Journal of Human Genetics, geneticist Irene Pichler and an international team of experts set out to unravel the genetic history of the Hutterites. The history of the Hutterites goes back over 500 years, to a stretch of land in northernmost Italy called Tyrol. It was here that a small group of people, led by local hatmaker Jakob Hutter, formed a religious community centered on absolute pacificism and communal living. The Hutterites, as they came to be known, were part of the Radical Reformation, which rejected the teachings of both the Roman Catholic Church and the more moderate Protestant movement. Due in no small part to their adherence to pacificism, the Hutterites soon became victims of persecution and expulsion. They moved several times to new settlements in central and eastern Europe. Their numbers dwindled significantly. By 1755, only 67 Hutterites were living in Transylvania. By 1874, the Hutterites had had enough, and over 1,200 departed Europe for the rich farmland of western North America. They settled in present-day South Dakota, setting up several colonies. Today they are living much as they were upon their arrival in both the United States and Canada. The Hutterites’ distinct and well-documented history over the past several centuries could make for an equally unique genetic history. Would traces of their history be etched in their genes? This is exactly what Pichler and her team sought to find out. Pichler’s team focused on two segments of the human genome: the mitochondrial DNA and the Y chromosome. Because mitochondrial DNA (mtDNA) is passed down along the mother’s line, and the Y chromosome is passed down along the father’s line, the team could use both to paint a detailed picture of the Hutterites’ genetic history. The research team also analyzed DNA from several Central European groups for comparison, as central Europe is the Hutterites’ ancestral home. Pichler proposed that the same constant reductions in population size that continually plagued the Hutterites, must also show up in their DNA. And that is exactly what happened. Among all the Hutterite DNA samples analyzed, the authors found only 11 distinct types of mtDNA (called haplogroups), and only 10 distinct Y-chromosome haplogroups. In other words, the Hutterites’ ancestral maternal and paternal lines trace back to just 21 individuals. This is an extremely small number of founders, and is further evidence that the large drops in Hutterite population size over the centuries are found in their genes. Pichler and her team further discovered that the haplogroups among the Hutterites are vastly different from those found among central Europeans. For example, 30 percent of Hutterites belonged to a single haplogroup called X2c1 – which is virtually absent in Europe. This shows that even while the Hutterites lived in Europe, their genetics were vastly different from their non-Hutterite neighbors. Centuries of isolation from the rest of Europe, followed by their massive migration to a new continent and continued isolation, have clearly defined the Hutterite people. And this study has revealed the history and genetics of this community as one of the most unique in North America.